If skunks are your pests, then you need them physically trapped and removed. Most pest control companies are used to spraying poisons for insects and small invertebrates. They don't deal with larger animals, like mammals and reptiles. The skunk is a mammal, and the only way to stop skunk damage is to catch the skunks in a cage and have them taken away from the area. 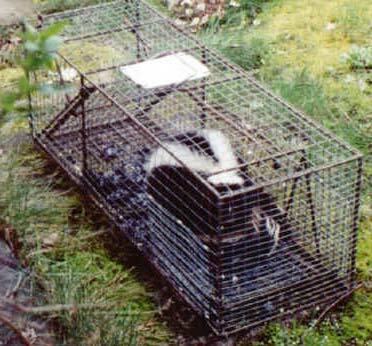 Here we see an skunk in a cage, caught by a professional wildlife management company, not a pest control company. If you ever have any problems with wild animals, don't look under the "Pest Control" or "Exterminator", or "Extermination" section of your local yellow pages, look under the "Animal Removal" or "Wildlife Control" section, and get a real pro to take care of those skunks once and for all. This site has links to professional trappers throughout the country, so maybe you can talk to one of them about taking care of your skunk issue. AAAnimal Control is a professional nuisance wildlife control company. Services include animal trapping, capture & removal, plus animal damage repairs and preventative measures. We also offer biological cleanup and many other services. If you live elsewhere in the US and have found this site and need a local trapper in your area, click here for my nationwide list of 100's of professional wildlife control experts. How to Get Rid of Skunks Under the Deck - Once a skunk has decided to stay under your deck, you need to worry about what activity is going to potentially set off the odor bomb lying in wait. Pets and skunks do not mix, though cats tend to leave skunks alone and vice versa. Dogs, on the other hand, have a hard time resisting the urge to torment a skunk, so canines are the most frequent target of spray attacks. Homeowners are less likely to be sprayed, though a startled skunk and a startle homeowner are not a good mix. To get rid of a skunk under the deck, you can remove the animal be using a live trap. Skunks living in one confined area are easier to remove than skunks out and about. To guide the skunk into the trap, you can set up a temporary fence around the base of the deck, leaving enough of an opening to funnel the skunk toward the trap. If baited properly, which can be with just about anything edible, a live trap is an easy way of removing a skunk. Once the animal enters the trap it can be relocated to a safe area away from the home.